The rock legends are coming to Blu-ray in January. In an early announcement to retailers, EMI says 'Motörhead: The World Is Ours - Vol.1 - Everything Further Than Everyplace Else' will have a Blu-ray release on January 24. 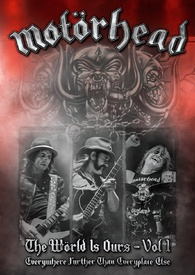 In celebration of their 35 years on the road Motörhead Music /UDR is proud to present 'The Wörld Is Ours-Vol 1 - Everywhere Further Than Everyplace Else,' a blistering DVD containing some of the finest moments from the tour, including the entire performance from Chile's Teatro Caupolican shot and filmed in classic black and white by Banger Films and Sam Dunn ('Iron Maiden Flight 666,' 'Rush: Beyond The Lighted Stage'). As well as this epic Motörperformance, exciting numbers from the shows in Manchester and New York are also included on the triple-disc digipack set, along with a series of extensive, in depth and exclusive interviews with the band, a bonus double live CD of the Chile show (incl. selected tracks from NY & Manchester), plus a superbly photographed booklet documenting life on the road during the tour. Specs have yet to be revealed, but supplements will include Interview Santiago: (9 Minutes), Interview Manchester: (23 Minutes), and Interview Atlantic City: (23 Minutes and a full track listing can be viewed here. Suggested list price for the Blu-ray is $17.98. You can find the latest specs for 'Motörhead: The World Is Ours - Vol.1 - Everything Further Than Everyplace Else' linked from our Blu-ray Release Schedule, where it's indexed under January 24.